We all love Champagne, right? But 99% of what Americans know as Champagne is from the big houses - Veuve Clicquot, Moet Chandon, Bollinger, Mercier, Piper Heidsieck, etc. These global brands have one objective in common - to produce, vintage after vintage - a champagne that expresses the house style. Sameness is key, and to achieve that house style (regardless of what happened in a given vintage) sometimes requires blending juice or wine from a thousand family growers. In contrast, Farmer Fizz is Champagne that is produce by one of those family growers. It varies from year to year as the producer's objective is to produce the BEST wine possible in a given vintage. So in the best vintages, as you can imagine, this approach allows the grower to produce far better wine than the big houses. Not so much in the lesser vintages. However, even the growers will produce a Non Vintage (N.V.) wine - a blend of wines from multiple vintages. These N.V. wines are the standard, even among the grower producers, who produce a vintage wine only in the best years. There is a relatively small amount of ultra-premium champagne that comes from the indifidual growers. Geoffroy would be one of them, and arguably, they are among the best. 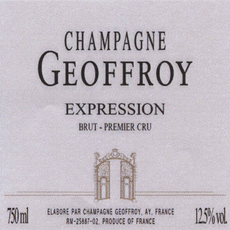 Jean-Baptiste Geoffroy is the current generation running the show here, and he is often described as "the most fanatical wine freak in all of Champagne". If you find yourself in the town of Ay be sure to book a tasting, he's just down the street from Deutz in a brand new gravity-fed facility. Perhaps the best version of this wine ever! 36% Meunier, 34% PN and 30% CH, much more than usual (the last time I carried this wine it was 100% Pinot Noir). It’s 57% 2012 and 43% 2011, but not disgorged until Feb 2016. It’s racy and salty and has zero pyrazine; an almost minty back-palate, a surprisingly silvery palate overall; a leap to a new level with this wine. Arrives “red” and departs “white”. Because of this malolactic is not needed to soften the palate. The wines are ripe enough. Geoffroy's Meunier brings hints of shiitake and soy, which could be over-powering if not reduced to a mere suggestion in this assemblage with all its Chardonnay.